Minimal change disease (MCD) is the etiology of 10%–25% of cases of nephrotic syndrome in adults. The mainstay of treatment for adult MCD, oral gucocorticoids, is based on two randomized controlled trials and extensive observational data in adults, and this treatment leads to remission in over 80% of cases. Relapses are common, and some patients become steroid-resistant (SR), steroid-dependent (SD), or frequently relapsing (FR). The data guiding the treatment of these patients are limited. Here, we review MCD in adults with particular focus on the evidence for immunosuppressive therapy in these patients. Minimal change disease (MCD) is characterized clinically by the nephrotic syndrome (NS) and a renal biopsy that shows no glomerular lesions on light microscopy (or only minimal mesangial prominence), negative staining on immunoflouorescence microscopy (or low-level staining for C3 and IgM), and foot process effacement but no electron-dense deposits on electron microscopy.1 MCD may also be suspected clinically in the absence of a biopsy by exhibiting responsiveness to corticosteroid treatment, and it is sometimes called steroid-sensitive NS. In children, because MCD is the cause of 90% of cases of idiopathic NS and usually exquisitely responsive to steroids, corticosteroid treatment is often initiated without a biopsy, unless clinical and laboratory evidence points to an alternative diagnosis. The causes of NS in adults are more varied, and although some physicians may choose a trial of corticosteroids without histologic evidence of MCD, a kidney biopsy is usually warranted to establish the etiology. In addition to Treg cell dysfunction, the roles of two podocyte proteins have been explored in MCD: CD80 and angiopoietin-like protein 4 (Angptl4). CD80 (also known as B7–1) is a transmembrane protein that is present on antigen-presenting cells and acts as a costimulatory signal for T cell activation. CD80 is also present in the podocytes of mice in MCD models and is necessary for resulting proteinuria.7–9 Soluble urinary CD80 levels are elevated in children and adolescents with MCD in relapse compared with those individuals in remission, patients with other glomerular disease, and control subjects.10 Furthermore, urinary CD80/creatinine ratios are increased in MCD in relapse compared with MCD in remission or FSGS.10 Thus, although only explored so far in research settings, CD80 may be a useful biomarker in MCD. Angptl4 is a secreted glycoprotein that is upregulated in the glomeruli of several models of podocyte injury in rats, including PAN.11 This upregulation is specific to models of steroid-sensitive NS compared with models of membranous nephropathy (passive heyman nephritis), mesangial injury (Thy1.1 nephritis), and collapsing FSGS (injection of rats with serum from patients with collapsing FSGS). Moreover, a transgenic mouse model showed that upregulation of podocyte Angptl4 results in proteinuria and histologic changes similar to those changes seen in MCD. To date, no Angptl4 studies have been conducted in humans with MCD. Most recently, the upregulation of NF-related κB has been shown in the nuclei of T and B cells of patients with MCD in relapse compared with patients with MCD in remission, control patients, and patients with membranous nephropathy.12 This finding implies that NF-related κB is involved in chromatin remodeling, which enhances transcription factor binding in relapsing MCD. As discussed below, the few controlled studies that have been performed in MCD patients show similar long-term remission rates between treated and nontreated patients.25,26 Given the risk of adverse events caused by current treatment modalities, one may ask whether MCD patients should be treated or not. However, the significant comorbidities associated with NS (hyperlipidemia,27 infections,16,28 skin breakdown from edema, risk of thromboembolic events,29,30 AKI, and worsened quality of life) prompt most physicians to recommend treatment for MCD patients. Importantly, drug-related adverse events become more common in FR and SD patients because of prolonged and repeated exposure to corticosteroids. There are two randomized trials that have explored the use of corticosteroids in adults with MCD. In 1970, Black et al.25 published a multicenter controlled study comparing prednisone (at least 20 mg/d for at least 6 months) with no steroid treatment in 125 adults with NS, 31 of whom had MCD. The steroid group showed a rapid decrease in proteinuria and improvement in edema within the first month of treatment compared with control. 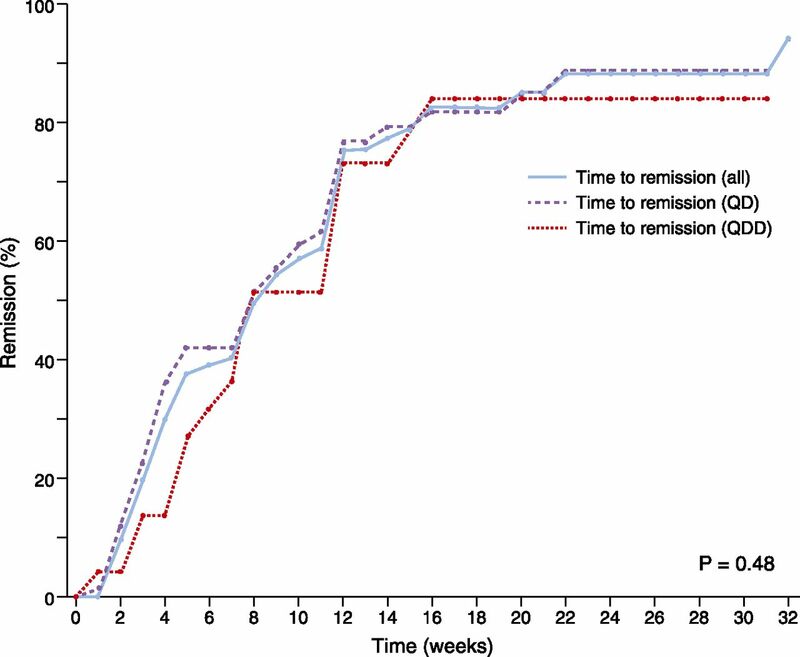 Importantly, by 2 years, a significant number of patients in the control group had experienced a spontaneous remission, leading ultimately to similar outcomes with respect to proteinuria, serum albumin, and edema in the two groups (Figure 1). Percentage of MCD patients with more than 1 g of proteinuria treated with prednisone versus no steroid treatment (control). Patients in the steroid group were treated with at least 20 mg/d for at least 6 months. Modified from reference 25, with permission. Similar results were shown in the only placebo-controlled trial of steroid treatment in adult MCD. The work by Coggins26 compared alternate-day prednisone (average dose=125 mg/d) for 2 months with placebo in 28 adult MCD patients. 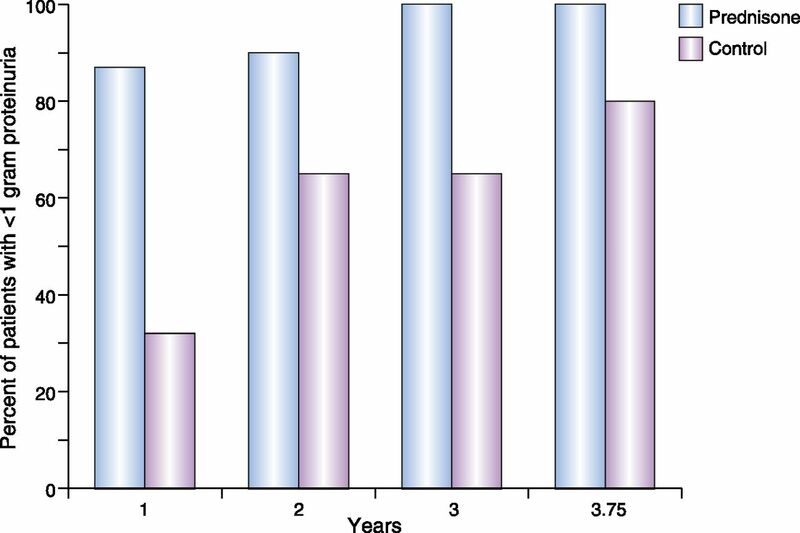 As observed in the work by Black et al.,25 steroid-treated patients remitted more rapidly, with 12 of 14 treated patients in complete remission before 2 months compared with 6 of 14 controls. However, there was no difference in overall remission rates over 77 months of follow-up. Adverse events were observed in four patients who were treated with more than one course of steroids. The effects of initial therapy with intravenous methylprednisolone compared with oral prednisone in adult MCD have been studied in two randomized trials. The work by Yeung et al.33 compared the efficacy of intravenous methylprednisolone (20 mg/kg per day for 3 days followed by a 2-week steroid-free period and oral prednisolone at 0.5 mg/kg) with oral prednisolone (1 mg/kg per day for 4–6 weeks followed by a taper) in 18 adults with MCD.33 At 2 weeks, 3 of 10 (33%) patients treated with intravenous methylprednisolone had attained remission compared with 5 of 7 (71%) of patients with oral prednisolone. The nonresponders in the methylprednisolone group then received oral prednisolone (1 mg/kg per day), and five of seven patients achieved remission. At 1 month, all patients in the prednisolone group had achieved remission. However, this study was limited by small enrollment, and it did not include measurements of proteinuria, renal function, serum albumin, or BP. Moreover, methylprednisolone therapy was considered to have failed if remission was not achieved 2 weeks after therapy, with no oral steroid use during this time. Imbasciati et al.34 performed a multicenter, randomized, prospective trial in 89 patients with MCD, 22 of whom were adults. The study group received intravenous methylprednisolone for 3 days (20 mg/kg per day) followed by low-dose prednisone for 6 months (starting dose of 0.5 mg/kg per day in adults for 4 weeks followed by taper over 5 months). The control group received high-dose prednisone (1 mg/kg per day in adults) for 4 weeks followed by low-dose prednisone for 5 months. In the adult cohort, remission (decrease of proteinuria to <100 mg/d) occurred in 8 of 11 (73%) study patients compared with 11 of 11 (100%) control patients. No differences were observed in time to response to treatment, number of relapses, or relapse-free event rate at 1 year of follow-up in the adult cohort. More patients in the control group experienced adverse events (obesity and Cushingoid facies) compared with the study group, but a subgroup analysis on adverse events in adults versus children was not performed. Similar to the study by Yeung et al.33, the trial by Imbasciati et al.33 was limited by small enrollment and did not report important clinical and laboratory data. However, given the higher remission rates observed in the oral prednisone groups combined with the ease of administration of an oral versus intravenous medication, oral steroid therapy is recommended. Alternate-day corticosteroid regimens for NS were first described in the 1950s,35 and they have been associated with less adrenal suppression, less effect on growth, and similar efficacy in children. However, no randomized or prospective trials comparing daily with alternate-day dosing have been performed in adults. Observational studies have shown similar remission rates.18,36 In the largest series examining daily versus alternate-day steroid regimens, Waldman et al.18 conducted a retrospective analysis of 95 MCD patients over 17 years of age treated at a single center in the United States; 88 of 95 patients were treated with prednisone for an average of 26.6 weeks. The initial dosing regimens were 1 mg/kg per day in 65 patients and 2 mg/kg every other day in 23 patients followed by a taper. There was no significant difference in rate of complete remission between the groups, time to remission, rate of relapse time to first relapse, or adverse events between treatment groups (Figure 2). Time to first remission in MCD adults treated with daily versus alternate-day steroids. QD, daily; QOD, every other day. Modified from reference 18, with permission. The optimal corticosteroid taper protocol in adults is also not known. In children, data support that slow steroid tapers may lead to less steroid dependence and relapse compared with rapid tapers. The work by Ueda et al.38 studied 46 incident children diagnosed with steroid-sensitive NS after treatment with high-dose steroids (60 mg/m2) for 4 weeks. They were then randomized to either rapid taper (prednisolone=40 mg/m2 for 3 consecutive days per week for 4 weeks) or slow taper (prednisolone=40 mg/m2 every other day for 4 weeks followed by a slow taper over 5 months). There was a higher incidence of FR and/or SD in the rapid- versus slow-taper group at both 6 months (51.7% versus 17.6%) and last follow-up (mean follow-up=46 months, 34.5% versus 5.9%). The slow-taper group initially received a 35% higher steroid dose than the rapid-taper group, but the total cumulative steroid dose at last follow-up was similar between groups. These data suggest that higher dose and longer taper of steroids lead to improved outcomes in children with MCD. The data for the use of steroid-sparing regimens in the treatment of the initial MCD episode are limited to case reports and case series. These treatments are reserved for patients who have relative contraindications (severe hyperglycemia or steroid-induced psychosis) or are unwilling to take steroids. Cyclophosphamide23,39–42 and cyclosporine43 have been used with response rates of approximately 75% with this limited experience (Table 1). Steroid-resistant (SR) MCD is defined as failing 16 weeks of corticosteroid treatment as outlined above. Approximately 10%–20% of adults with MCD are resistant, and a repeat renal biopsy in these patients may show FSGS. This result is associated with a worse prognosis, and treatment regimens should follow the recommendations for steroid-resistant FSGS.37 Available treatment regimens for SR MCD are further described below. Relapse rates in adult MCD are high, with case series data showing that 56%–76% of patients experience at least one relapse after steroid-induced remission.17,18,22,23,44 Relapses are also seen in 40% of adults who had MCD during childhood.24 A course of corticosteroids is usually administered for the first relapse, although there are no trials to support this practice. Eguchi et al.45 randomized 52 MCD adults with their first relapse to cyclosporine (area under the curve=1700–2000 ng/ml) plus prednisolone (0.8 mg/kg per day) or prednisolone monotherapy (1 mg/kg per day). Remission was achieved sooner in the cyclosporine group, with the possible additional benefit of lower exposure to steroids. It should be noted that these patients had quiescent courses after their first episode of MCD, with a time from remission to relapse of greater than 2 years. After an initial relapse episode, MCD patients are classified as infrequent relapsing, FR, SD, or SR (Table 2). These categories are somewhat arbitrary, and the definitions used here are the definitions recently published in the Kidney Disease Improving Global Outcomes Clinical Practice Guideline for Glomerulonephritis.37 Infrequent-relapsing patients may be treated with a course of corticosteroids identical to their previous regimen when relapse occurs. FR patients are those patients who have had two or more relapses within 6 months of initial response or four or more relapses in any 12-month period. SD patients are those patients who have had two relapses during or within 2 weeks of completing a course of corticosteroids. Up to 33% of patients will become FR (11%–29%) or SD (14%–30%) patients.17,18,22,23 FR and SD patients tend to be younger than infrequent relapsers or non-SD patients, and these patients require alternate treatment regimens for future relapses and long-term maintenance therapy. With a repeated course of steroids, some patients may also become SR. In retrospective reports (Table 3), oral cyclophosphamide (CYC) leads to remission in a significant number of FR or SD adults with MCD.18,19,23,41 The relapse-free interval seems to be longer than with cyclosporine (see below). The work by Nolasco et al.23 described the use of oral CYC in 36 patients with MCD: CYC was used by 2 patients as primary therapy, 11 patients were SR, 10 patients were SD, and 11 patients were FR. The remission rates were 58% and 69% at 8 and 16 weeks, respectively. The rate of sustained remission in this group was 66% at 4 years. Moreover, the total relapse rate was 40% in the CYC group compared with 76% in the steroid group. The addition of prednisone to CYC did not add benefit in these patients, and shorter time to remission with initial steroid treatment was associated with shorter time to remission with CYC. Mak et al.19 used oral CYC at 2–2.5 mg/kg per day for 8 weeks in 22 MCD patients who were SR (n=2), were SD (n=9), were FR (n=5), had steroid psychosis (n=1), or were having a first relapse after corticosteroid treatment (n=5). The cumulative remission rates in this group were 86%, 74%, and 63% at 1, 3, and 5 years of follow-up compared with 50%, 35%, and 26% for corticosteroid therapy. Within this group, the five FR patients had a high rate of sustained remission (80% at 9.1 years mean follow-up) compared with the SD group, of whom four (44%) patients experienced sustained remission and five (56%) patients experienced additional relapses. In a retrospective case series, Waldman et al.18 reported the use of oral CYC (mean oral dose=123.6 mg/d, mean duration of therapy=11.5 weeks) in 20 patients. The cumulative remission rate in this cohort was 55% (n=11), with a mean time to remission of 6.4 weeks. Remission occurred in 80% of SD (n=5) compared with 50% of SR (n=4) patients. Seven patients experienced subsequent relapses. There are two open-label, randomized prospective trials that describe the efficacy of intravenous CYC compared with oral tacrolimus in adults with MCD.46,47 Intravenous CYC was chosen because of the higher rates of remission, lower incidence of adverse events, and lower cumulative medication dose of intravenous CYC compared with oral CYC in children with SR-MCD.48,49 The first study randomized 26 adults with SD MCD to receive tacrolimus (n=12; dosed to achieve trough level of 4–8 ng/ml) or intravenous CYC (n=14; CYC dose=750 mg/m2 monthly) for 24 weeks. Both groups received oral prednisone until remission. At 24 weeks of follow-up, complete remission was achieved in 91% of the tacrolimus group compared with 77% of the intravenous CYC group. Similar remission rates at 48 weeks (50% in the tacrolimus group and 60% in the CYC group) and rates of relapse (40% in the CYC group versus 50% in the tacrolimus group) were observed, and the percentage of patients who were able to become steroid-free was also similar. The second trial49 randomized 37 adults with SR MCD to receive steroids plus either tacrolimus (n=21; trough level=5–10 ng/ml) or intravenous CYC (n=16; administered monthly for 6 months and then every other month for 6 months, total dose=10 g/1.73 m2) for 1 year; 6-month and 2-year cumulative remission rates were again higher in the tacrolimus group (tacrolimus: 78.9% and 62% versus CYC: 50% and 37.5%). Relapses were more common in the tacrolimus group in this trial. In both trials, the CYC treatment group was older than the tacrolimus group, time to remission was shorter in the tacrolimus group, and there were similar rates of adverse events between treatment groups. Ponticelli et al.55 randomized 73 patients (11 adults and 62 children) with FR/SD NS (31 patients with MCD and 42 patients with FSGS) to CYC (2.5 mg/kg per day) for 8 weeks or cyclosporine (5 mg/kg per day) for 9 months followed by a 3-month taper to withdrawal. At 9 months, 64% (18/28) of patients on CYC and 74% (26/35) of patients on cyclosporine maintained remission (P = NS). However, at 2 years, 25% of patients assigned to cyclosporine versus 63% of patients assigned to CYC were still in remission. In the retrospective case series by Waldman et al.,18 cyclosporine (mean dose=220 mg/d, target trough=150–200 ng/ml) was used in 39 patients (including n=8 SD patients and n=20 steroid-resistant patients) for a mean duration of 49.5 weeks. Remission was achieved in 61% of these patients, with a mean time to remission of 5 weeks (range=2–9 weeks). A trend to higher remission rates was observed in the SD (75%) compared with the SR (45%) group; 41% of patients relapsed after cyclosporine discontinuation. In children with MCD, mycophenolate mofetil has been used as a steroid-sparing agent. In adults, mycophenolate mofetil has shown efficacy in case reports and small case series,18,60–68 with remission rates of 60%–80% in this limited experience. The use of rituximab in adults with FR and immunosuppression-dependent MCD has been reported in case reports and small uncontrolled case series with some success.69–79 These studies indicate that response to treatment is associated with peripheral B cell depletion. AKI can occur in patients with MCD and may be severe enough to require dialysis. As discussed above, risk factors for AKI in MCD include older age, hypertension, severe NS, and arteriosclerosis on renal biopsy.18,21 Kidney function typically recovers even in the most severely affected patients, although patients who have experienced AKI may have residual chronic renal impairment.18 Careful attention to patients’ volume status, supportive therapy for AKI, and continued therapy with corticosteroids are suggested. Albumin infusion may be considered if there is evidence of severe intravascular volume depletion with severe hypoalbuminemia. Because proteinuria and hyperlipidemia in MCD typically improve with disease remission, the success of corticosteroid therapy usually obviates the need for inhibitors of the renin-angiotensin-aldosterone system or statin therapy during initial MCD episodes or infrequent relapses. One study of 40 adults who had relapsing NS as children did not show a higher incidence of cardiovascular disease, implying that long-term cardiovascular risk was not increased by intermittent hyperlipidemia during nephrotic relapses in childhood, although this study was small and no firm conclusion can be derived from the data.89 The use of renin-angiotensin-aldosterone blockers and statins may be considered on a case-by-case basis in MCD adults, particularly those patients with hypertension. Adults with NS caused by MCD continue to pose a challenge to clinicians. Unless a contraindication exists, corticosteroids (with daily or alternate-day dosing) continue to be first-line therapy for MCD in adults, with longer treatment duration and slower tapers required compared with children to attain remission and minimize relapses. Relapse is common, and many patients will become FR, SD, or SR. The availability of nonsteroidal immunomodulatory therapies allows the treatment of complicated and resistant patients to be tailored individually based on the adverse event profiles of these medications. Preclinical and patient-based research studies continue to shed light on this poorly understood disease.